Villa Conched Out Turks & Caicos. 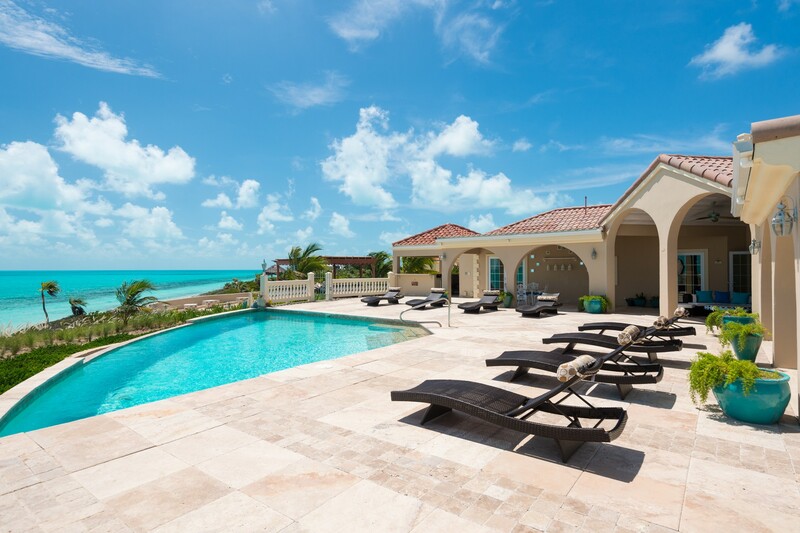 Sitting along the dazzling white sands of Long Bay Beach on Providenciales in Turks & Caicos, the Villa Conched Out is a stunning find. With seven bedrooms, this luxuriously spacious villa is a destination in its own right. The views of the flawless turquoise sea, the ability to enjoy endless sea breezes and stunning sunrises and sunsets, and the amazing grounds will all provide you with an idyllic Caribbean experience. The focal point of the property is the stone pool terrace that is designed in a unique, semi-circular format made to capture the most impressive views of the sea and sky. Surrounded by lounge chairs and sun beds, it opens to a lovely pergola where hammocks and swings will tempt even the adults to while away some time in the dappled shade and sun. Step beneath the covered terrace and relax on the circular sofa that enables you to enjoy total comfort while doing a bit of stargazing and lounging. The portico also contains additional al fresco dining areas for cocktails or coffee. Step through the arched doors into the enormous great room and wonder at the impressive design and décor. A formal dining area opens to the enormous and modern kitchen where even a novice can prepare excellent meals and snacks. Nearby is an opulently furnished lounge. Stairs lead to the rooftop sundeck, where you can lounge or take in more of the scenery. The bedrooms are spread out between the ground and second floor, with four king suites on the first floor and three additional on the ground level. The first floor suites all have access to the patio and ensuite bathrooms. The upper suites feature ensuite bathrooms and excellent views. The Villa Conched Out has amazing views, impressive amenities and a coveted location along one of the finest beaches. It is the perfect choice for a group holiday or ultimate family retreat. Bedroom 1: First floor Master bedroom with a king-size bed, A/C, TV, access to patio and en-suite bathroom with shower, vanity and wc. 2 guests maximum. Bedroom 2: First floor bedroom with a king-size bed (can be converted to two twins), A/C, TV and adjacent en-suite bathroom with shower, vanity and wc. 2 guests maximum. Bedroom 3: First floor bedroom with a king-size bed, A/C, TV, access to patio and en-suite bathroom with shower, vanity and wc. 2 guests maximum. Bedroom 4: First floor bedroom with a king-size bed, A/C, TV, access to patio and en-suite bathroom with shower, vanity and wc. 2 guests maximum. Bedroom 5: Ground floor bedroom with a queen-size bed, A/C, TV and en-suite bathroom with shower, vanity and wc. 2 guests maximum. Bedroom 6: Ground floor bedroom with a queen-size bed, A/C, TV and en-suite bathroom with shower, vanity and wc. 2 guests maximum. Bedroom 7: Ground floor bedroom with a queen-size bed, A/C, TV and adjacent en-suite bathroom with shower, vanity and wc. 2 guests maximum. Amazing property and perfect beach. Constant breeze broke the heat, water was perfect and the beach was perfect for endlessly long walks. Pool was just right fur the kids and the daily caretaker and maid service covered just about every need. Hard to find any complaints on this one, thanks for the opportunity to stay at your place. I would highly recommend a rental car for getting in and out and taking occasional outings around the island. Stayed in late August with a group of friends. The photos do not do justice. Very nice, quality Villa right on the beach. I can't say enough about this place. Remote enough for privacy, but short drive to stores, restaraunts, boats, etc. I would book again with confidence. We stayed here a few times and continue to find reasons to return to Turks and Caicos. The house is really well maintained, the guest rooms all have AC, new towels and amazing linens. There is daily maid service and you can also relax with an outdoor massage on the patio. The beach here is uber private and if you are looking for a place with a lot of noise and tourists, you won't find any of that here! It's so serene, the beach and views from the house are amazing. Very jealous of anyone who is going there soon!